The Centre for Mobilities Research at Lancaster University (CeMoRe) is hosting an ESRC sponsored conference “The Business of Immigration Detention: Activisms, Resistances, Critical Interventions” (which is the final event in part of a larger series of workshops titled ‘Exploring Everyday Practice and Resistance in Immigration Detention’). Bringing together a range of leading academics, post-graduate researchers, practitioners, artists, activists and former detainees this seminar series will investigate the ways in which the UK experience of detention reflects and re-produces the contradictory logics inherent in contemporary global detention practices. “The Business of Immigration Detention” will consider the challenges facing academics and activists in the area of immigration detention and related border-security practices. The administrative detention and deportation of adults classified as ‘illegal’ escalated in the late 1990s with a policy shift from the detention of very small numbers of migrants in mainstream prisons to the development of specialist migrant detention facilities. Successive UK governments have argued that this escalation in detention is ‘an essential, everyday facet of immigration control’ and ‘regrettable but necessary’ (see Silverman 2012). 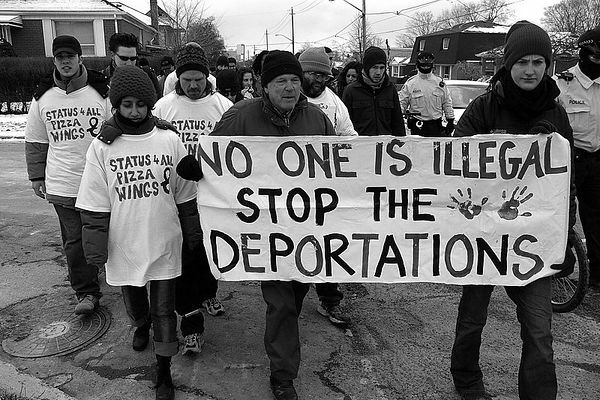 However, while arguments about the ‘necessity’ of detention are grounded in notions of deterrence, threat and security, the expansion of immigration detention, and the practices that determine who is taken into detention, are also driven by business interests. Detention is a business, and the profits to be made are key determinants of both transnational and state-level policy formation and everyday detention practices. Further, this global business is proliferating new markets for global securities companies which extend outside the detention estate into the provision of services, such as housing and welfare for migrant and increasingly ‘citizen’ populations (for example in running prisons, policing and schools services). At this conference we will consider what Frances Webber describes as ‘the vexed question of when, if and how we should engage with statutory bodies and whether it is possible to do so without jeopardising the principles which led us to get involved in this work in the first place’? (Weber, 2012). Should activism and activist-scholarship aim to resist state practices of detention entirely, or work with private and state actors in order to change detention practices? What forms of critical intervention and resistance are useful or possible in this field? To address these and other questions, we have invited leading scholars, artists and activists to address to share their research and experience, and to reflect, listen, learn and debate questions of resistance to immigration detention, from local, national and global perspectives. Professor Alice Bloch (Manchester University) ‘Living illegality: Multiple exclusions and uncertainties’. In this talk I will draw on my on-going research in British IRCs to discuss a range of methodological and ethical challenges I face. In so doing, I explore the tensions inherent in maintaining research access while building a critique of current practice. What are the pressures, risks and benefits? How, under conditions of radical uncertainty and vulnerability can we build relationships of trust with research subjects or with research gatekeepers? Christine Bacon is Artistic Director of ice&fire, who will be performing at a free public event at Lancaster University chaplaincy Centre on the evening of Thursday 23rd of January to mark the beginning of our conference. Christine has been involved in numerous grassroots campaigns, including Actors for Refugees Australia. She moved to the UK in 2004 to complete an MSc. in Forced Migration at Oxford University. She founded ice&fire‘s outreach network Actors for Human Rights. Plays for ice&fire include On the Record (with Noah Birksted-Breen); Afghan Monologues, Rendition Monologues; The Illegals; Broke; Seven Years with Hard Labour (with Sara Masters); and Listen to Me (with Sara Masters). John Grayson is an independent researcher and adult educator. He was Senior Tutor for research at the Northern College for residential adult education until 2006 and taught Housing Studies at Sheffield Hallam University. He lives in Barnsley and is an activist and campaigner with SYMAAG (South Yorkshire Migration and Asylum Action Group). John has published widely on anti racist issues for the Institute for Race Relations news service; and on immigration issues, especially on privatisation and asylum housing. He has been involved with the transnational ‘Stop G4S’ activist network. Professor Alice Bloch is Professor of Sociology at the University of Manchester. Her research focuses on understanding the lived experiences of forced migrants with a focus on marginalisation and exclusion, rights and agency, engagement in transnational relations, social and community networks, economic strategies and labour market experiences. Recent publications include, Sans Papiers: The social and economic lives of undocumented migrants in the UK (Pluto Press with Nando Sigona and Roger Zetter). She has recently completed an ESRC funded study (2011-14), with Professor Sonia McKay from the Working Lives Research Institute, London Metropolitan University, ‘Undocumented Migrants, Ethnic Enclaves and Networks: Opportunities, traps or class-based constructs’. Her current research is a collaboration with Professor Milena Chimienti, University of Applied Sciences and Arts Western Switzerland and Professor Catherine Withol De Wenden Sciences Po Paris, on a project funded by the Swiss Network for International Studies, ‘Children of refugees in Europe: Aspirations, social and economic lives, identity and transnational linkages’.